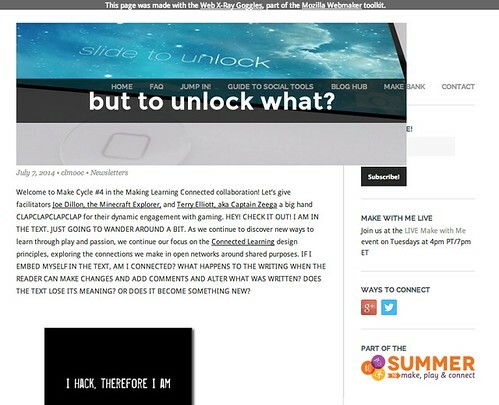 The theme of the Make Cycle with the Making Learning Connected MOOC is now Hacking Your Writing. 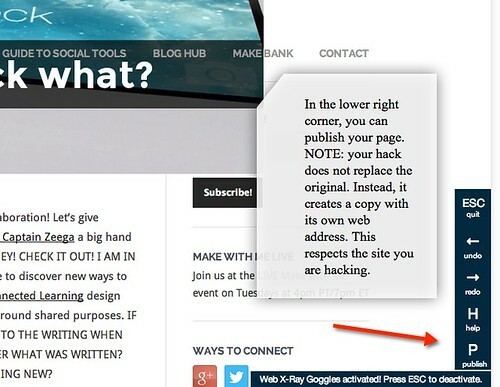 I decided I would hack the newsletter announcing the them of Hacking Your Writing. I used Mozilla’s X-Ray Goggles, which allows you to create an overlay on websites, and provides you with the opportunity to remix/hack the site, and publish your alternative to the original. I used CAPITAL LETTERS to add my voice to the newsletter, and changed a few images. You can view my hack here. And maybe you want to do your own hacking with X-Ray Goggles? Well, in the spirit of the first Make Cycle of the CLMOOC, where we all created How To … pieces, this is how you use the free X-Ray Goggles to tinker with some remixing. First, you will need to create an account with Mozilla Webmaker. This is worth it because the tools there (not just X-Ray Goggles but also Thimble and Popcorn Maker) are powerful and getting better all the time. 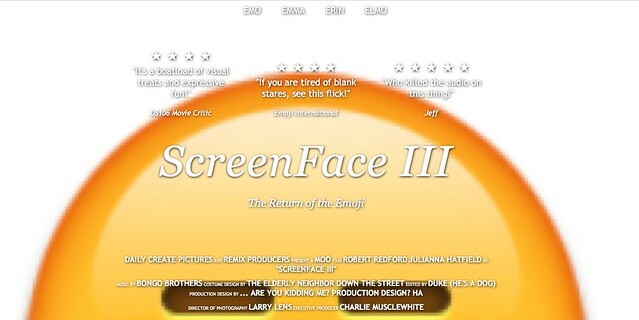 Next, find a website that you want to hack or remix and call it up in your browser. Activate X-Ray Goggles by clicking on the bookmarklet sitting in your tool bar (the one you dragged up). This opens up the X-Ray Goggles editor. Tinker around with elements of the website, such as changing the text. You can even replace images. Just find the url of the image you want and make the change in the code. Publish your remixed page and share with the world. There are tools on the lower right side of the page. Why would we teach this to our students? X-Ray Goggles shows the underlying code of the World Wide Web, which many young people are unaware of. They think of websites and social media platforms as being pretty interfaces, not built on underlying code. X-Ray Goggles shows what is under the hood, so to speak. X-Ray Goggles gives young people a chance to work with code in playful environment.One activity I did with my students was to talk about reliable sources with the Tree Octopus site, and then they hacked the site themselves, adding to the absurdity of it. X-Ray Goggles puts a remix tool right at their fingertips, and activities tap into play in a meaningful way. It also opens a chance to talk about responsible hacking — not remixing for nefarious reasons but remixing for change, and to add a new voice to the conversation. It moves the “hack” word from the newspaper headlines. X-Ray Goggles is a great tool for argument and rebuttal — take the front page of the New York Times or Wall Street Journal, and change the news stories — add different slants, revamp the news of the day — who really owns the stories we read anyway? What better way to think about that than to do it ourselves? I suggest you give it a try and see what you can make. Then, consider the possibilities, and share it out. Feel free to remix what I did, too. I tinkered around with the A Little About Me page via Webmaker this week. I like it as a simple introduction to remixing with Thimble. (Mostly text, not too much media).You can feel free to remix the page, too, and create your own. A bunch of folks were doing it as part of the Teach the Web series underway right now. I used Mozilla’s Popcorn Maker, with the new search tools for Gliphy built right into the site, which is very handy! Plus, anytime you can add NRBQ to a project, you should! I am dipping into this year’s Teach the Web by Mozilla. I took part last year and learned a whole lot. This year, I might not have as much time, but I love how they have really broadened the inquiry along a few different lines. One of the introductory activities is to do a Make with one of the Webmaker tools, so I took Chad Sansing’s Planet Project and remixed it into a sort of belief idea around Connected Learning. 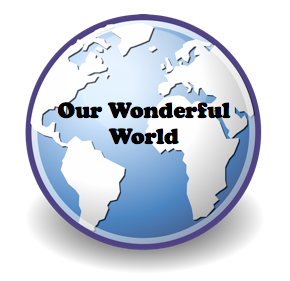 Today’s Wonder of the World poem is about the colorful phenomenon of the Aurora. I dove back into Webmaker to find a way to liven up my poem about “surfing the solar wind” and came upon a cool space-themed template by my friend, Chad. Click on the image to go to the multimedia poem. 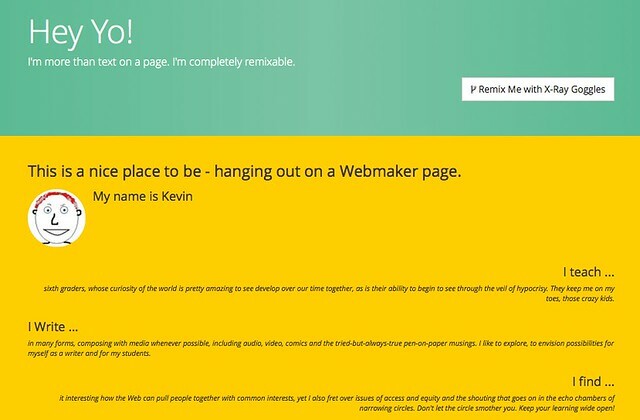 As always, there is a “remix” button at the top of the Webmaker page. Click that and remix away. I feel like I can’t shout quite loud enough about the resources being developed over at the Mozilla Foundations’s Webmaker space. Here, the philosophy of the “open, remixable web” comes to fruition with a series of projects and tools that invite you to remix and remake in your own light, with tutorials on coding and creating that provide entry points for just about anyone with an interest. 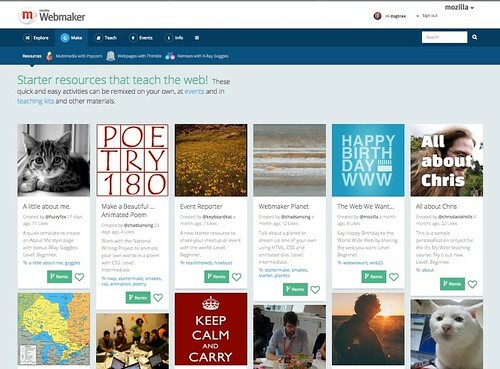 Mostly using its Thimble (a webpage-style publishing tool) and Popcorn (a video and digital story tool) platforms, Webmaker offers free and interactive ways to become engaged with digital literacies. You will need an account with Webmaker to save work (but you can tie it to other email accounts) and I am still navigating the best way for my sixth graders to create work in our environment where they don’t have school emails (ack). But at the very least, you can explore the world of making the web with its remixable templates, and there is the built-in ease of publishing in a matter of minutes just by clicking the “remix” link on any of the projects, tinkering with code and text, and remaking it into something new. There are also sections at the Webmaker space for how to teach with its tools, where all sorts of “kits” are available for free, and freely remixable for your own situation. 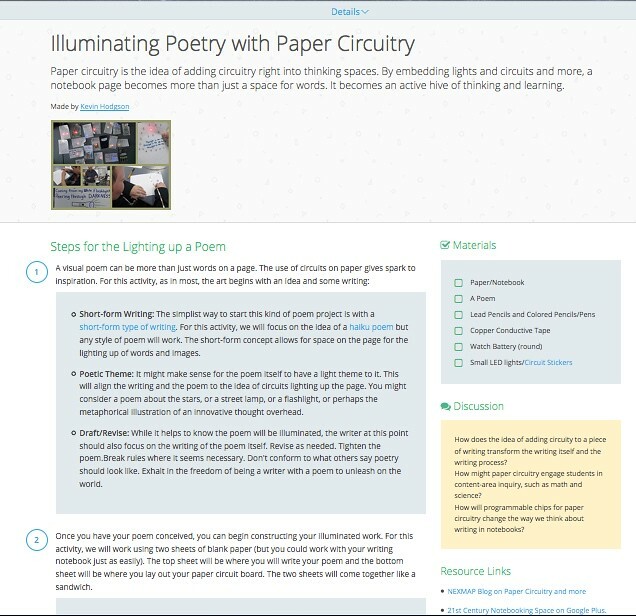 You can also use their blank templates for your own lesson plans and ideas. Go ahead. Remix. Publish. Share. Make stuff and have fun. One thing I have been intrigued about when it comes to doing some research on the topics for the Wonders of the World poems are the translation of names of places on the list that Mary Lee has pulled together. So, this morning, when I was learning about Chichen Itza, the Mayan city, I was intrigued by the poetic translation of the name as “the mouth of the well,” and that led me into my poem. I like how it came out, with each hovering over a section of the poem revealing a stanza. I did podcast the poem but could only fit it at the bottom of the page, which is not ideal, although I suppose this way, the audio does not disrupt the reading of the poem in sections.